You see a map that shows territory of Russia. You can find here city Arkhangel'sk for Garmin. city Severodvinsk for Garmin. You can find here city Novodvinsk for Garmin. Displayed town Leshukonskoye for Garmin. You can find here town Karpogory download for free. On this map town Kholmogory for Garmin. town Mezen' presented. town Pinega presented. You can find here town Uyemskiy presented. town Kamenka download for free. On this map town Katunino download for free. On this map town Lukovetskiy for Garmin. Displayed Kashkarantsy presented. Displayed Kuzomen' marked. Displayed Yezevets presented. Displayed Nizhniy Bereznik download for free. 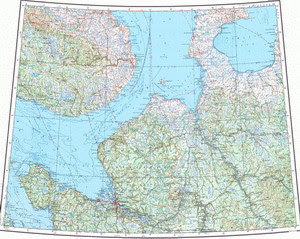 On this map Zlodeyka marked.